The United Nations refugee agency has condemned an agreement between Bangladesh and Myanmar about minority Rohingyas. Under the agreement, Bangladesh would return thousands of Rohingya Muslims to Rakhine state in Myanmar. The ethnic group began fleeing that area in August 2017 to escape violence. The return is to begin next month. 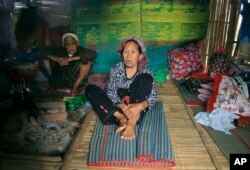 However, the U.N. refugee agency said conditions in Rakhine are not right for a safe, respectful return. A UNHCR spokesman said that the UN will not assist with such refugee returns because Rakhine state is unsafe for Rohingyas. Bangladesh reportedly gave Myanmar the names of more than 5,000 Rohingya refugees who had been processed for return. On Wednesday, Myanmar officials visited camps for Rohingya Muslim refugees in Bangladesh. The officials wanted to persuade the refugees that it is safe to return. A group of about 60 Rohingya community leaders met a delegation of about 12 Myanmar officials in the Kutupalong camp, said two Rohingya men who were present. Kutupalong camp in Bangladesh is the largest refugee settlement in the world. Myint Thu, permanent secretary at Myanmar’s Ministry of Foreign Affairs and leader of the Myanmar delegation, said Myanmar had confirmed about 5,000 names of refugees. He said that repatriation would begin with 2,000 returnees in mid-November. It is unclear if these 2,000 have agreed to return to Myanmar. “We are here to meet with people from the camps so that I can explain what we have prepared for their return and then I can listen to their voices,” he told reporters near the camp. Bangladesh handed over an additional list of more than 22,000 Rohingya refugees to Myanmar, Relief and Repatriation Commissioner Abul Kalam told Reuters. Some Rohingya women and children in an unidentified refugee colony in West Bengal, eastern India in April 2018. Rohingya leaders said after Wednesday’s meeting that they were not convinced they should return. “They told us we don’t have to stay (in a camp) for long, but when we asked for how many days they could not say,” said Mohib Ullah, an important Rohingya leader in the Kutupalong camp. Mohib Ullah said Rohingya leaders wanted Myanmar to recognize them as an ethnic group with the right to Myanmar citizenship before they return. Myanmar does not recognize the Rohingya as a native ethnic group. They have lived as a stateless people for six generations. Many in the Buddhist-majority country call the Rohingya “Bengalis”, suggesting they belong in Bangladesh. A Reuters reporter examined a pamphlet given to refugees by Myanmar officials on Wednesday. It says Rohingya should accept new identity cards as a “first step” to citizenship. Many Rohingya reject the cards, which they say call them Bengalis and not citizens of Myanmar. Those with “national verifications cards” (NVCs) would be guaranteed government assistance, but those without will be “stateless," the pamphlet says. The Rohingya leaders gave the delegation a letter for Myanmar leader Aung San Suu Kyi. It set out their demands, which include payment for the violence they have faced. Ethnic Kachin Nlam Numrang Doi, 92, sits along with her husband Hkaraw Yaw, 102, at their hut in compound of Trinity Baptist Church refugee camp for internally displaced people in Myitkyina, Kachin State, northern Myanmar, May 6, 2018. U.N. rights investigators said in August that Myanmar’s military acted with “genocidal intent” during last year’s violence. China has played an important role in the situation. It sided with Myanmar when the refugees fled. Now China is holding talks with the Bangladesh government to speed up the repatriation. Western countries and the United Nations have said that all returns must be voluntary. They have also called on Myanmar to take responsibility for the military’s violent abuses. Many Buddhists from Rakhine state do not want the Rohingya to return. Buddhists are the majority population in western Myanmar’s Rakhine state. Than Tun is a Rakhine community leader. He said those who return should be placed in a part of the Maungdaw area close to the border. They should not be allowed to return to the formerly Muslim-majority areas, he added. “We Rakhine don’t want them to come back at all, but we understand there’s international pressure,” he said. Susan Shand adapted this story for Learning English based on Reuters news reports. George Grow was the editor.